The band have recorded soundtrack and incidental music extensively. 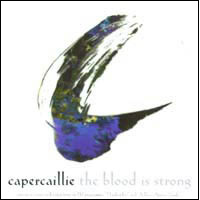 Their 1996 album The Blood Is Stong (SURCD 014) is a compilaton of work done for television and includes tracks from the shows: Highlanders, A Prince Among Islands and the Grampian Television series of the same name as the album The Blood Is Strong. They alsorecorded several tracks for the Rob Roy soundtrack and a single from the soundtrack album entitled "Dark Alan" (SURCD 55) was released by Survival Records in 1995. Perhaps you heard them in the film Rob Roy. They have also made soundtracks for television films, including one about the Highland Clearances entitled The Blood Is Strong. A CD by that name has come out featuring Gaelic songs from this and two other TV films, plus a bit of the atmospheric music that has become a part of Capercaillie’s sound, perhaps as a result of their film work.